The Human Computers at NASA digital archive, a student/faculty collaboration at Macalester College's American Studies Department. Photo courtesy of Macalester College. "I want young people to think of the African American experience as the American experience." Well before the Oscar-nominated film Hidden Figures hit theaters nationwide in December 2016, Duchess Harris, a recipient of the Mellon Mays Undergraduate Fellowship (MMUF) and Professor and Chair of the American Studies Department at Macalester College, was busy unearthing the stories of African American women who worked at NASA from 1943 to 1970. One of these women was Miriam Daniel Mann, Harris’s grandmother. Through her book Hidden Human Computers: The Black Women of NASA and her “Human Computers at NASA” digital archives project at Macalester, Harris has uncovered for future generations the long-neglected, groundbreaking contributions of African American women to the NASA space program and to scientific achievement in the U.S. Her new collection at Abdo Publishing links the past to the present, addressing movements from women’s suffrage to Black Lives Matter. The Mellon Foundation sat down with Harris to discuss her scholarly work, the development of her “Human Computers at NASA” project, and the contributions of her grandmother, Miriam Mann, one of the earliest "Hidden Figures." Duchess Harris. Photo courtesy of Macalester College. How did you find out about the MMUF program? In the spring of 1989, I was a sophomore at the University of Pennsylvania and I was approached by Valarie Swain-Cade McCoullum who is the vice provost for University Life at Penn. She asked me if I would like to apply to be a Mellon Mays scholar. I was delighted for the opportunity; my hope at the time was to eventually join the faculty at either a liberal arts college or a research institution, so the program helped me realize my academic goals. How has the program served you since then? My MMUF experience gave me a national network that I would not have had without it. Sometimes, when you start a new position, you can feel isolated on your campus. Being able to go to national meetings provided an opportunity for me to have dialogue with other scholars and to get the mentoring that I needed. In 2015, the Minnesota Black Lawyers Association awarded you a Profiles in Courage award; you also earned your JD from William Mitchell College of Law. How did your legal studies fit in to your work as a scholar? The point of going to law school was not to be a practicing attorney. A year before I defended my dissertation, I was a fellow at the Institute of Race and Poverty at the University of Minnesota Law School working on legal research and public policy to address concentrated poverty in the twin cities. I wanted to be able to teach race and the law. I went to law school part-time at night, and that’s how I got my law degree. The Profiles in Courage Award came after I co-authored the book Black Lives Matter with Sue Bradford Edwards. And I have to say, that’s one of the biggest things that’s happened in my career. How was the Human Computers at NASA archive project born? In 2013, I got grant money from Macalester to conduct research for both the book and the digital archive. We went to the NASA archives the following year. My history courses at the University of Pennsylvania had taught me that the grounds of NASA used to be the Chesterville Plantation, which made complete sense to me when I saw the diagram of one of the buildings where my grandmother worked showing racially segregated dining halls. There were ten NASA locations in addition to Langley in Hampton, Virginia, and eight of them were in the segregated south. The documents that I was able to see really helped me formulate my research questions for the archive, and also helped me put together the book. Miriam Daniel Mann walking to work in 1943 in Hampton, VA. Photo courtesy of Duchess Harris. Your grandmother was one of the early "Hidden Figures" and is featured in the digital archive. What stories did you hear about her when you were growing up? My grandmother was four feet eleven, and we called her “big momma.” It’s pretty remarkable if you see pictures of her to imagine that anyone would call her “big” anything. But she was a force to be reckoned with. My grandmother removed the colored sign from the grounds of NASA several times. It was actually a small sign on a wall that she would slip off and put in her purse. My grandfather was a professor at Hampton Institute and he was afraid that my grandmother would get fired if she were caught for stealing the sign. My grandmother made $1,400 a year which, in 1943, was a significant amount of money. 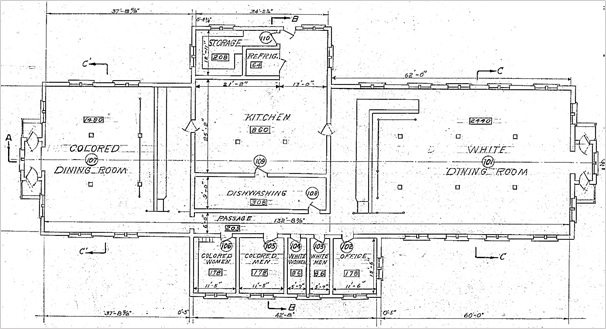 Architectural blueprint showing the west area cafeteria and segregated dining halls at NASA Langley, 1944–1948. Image courtesy of NASA Langley. Did your grandmother understand the profound contributions she was making to science at the time? Everything at NASA was such top security. Actually, my grandmother worked on Friendship 7 and met John Glenn. Friendship 7 was one of the flights we launched off into space a few years before we went to the moon. My grandmother worked at NASA until 1966; we landed on the moon in 1969. When she was doing her calculations, she wasn’t always informed what she was doing them for. Although your new book series is appropriate for all ages, your primary readers are middle school students. How do you approach writing about modern-day civil rights issues for a young audience? One of the most humbling experiences I've had as a scholar is publishing a book on Black Lives Matter in the fall of 2015, fourteen months before Hidden Human Computers went to press. I saw the Black Lives Matter story and the Hidden Human Computers story as being about people from the same families. I want young people to think of the African American experience as the American experience. I want them to think about legacy. It’s important to know that people of African descent have been here since 1619 Jamestown. Despite the struggles, there’s been tremendous resistance, there’s been tremendous triumph. The contributions that African Americans have made to this nation need to be documented, understood, and appreciated. Duchess Harris on her grandmother Miriam Mann, one of NASA's earliest "Hidden Figures"
"Desegregation began in 1954. My grandmother started working at NASA in 1943. When I started to learn about World War II and the segregation during that time…it helped me realize the magnitude of what my grandmother did." Hidden Human Computers: The Black Women of NASA, by Duchess Harris and Sue Bradford Edwards. Abdo Publishing, 2016.